“Spider-Man: Into the Spider-Verse” is an artful masterpiece, animated with a beautiful and bright comic-style that is unprecedented in the genre. The concept of the movie presents concerns for moviegoers, as the story of another radioactive spider-bite and superhero movie may give audiences superhero fatigue, but directors Bob Persichetti (Puss in Boots), Peter Ramsey (Rise of the Guardians) and Rodney Rothman (22 Jump Street) had the perfect solution. The movie uses the audience’s knowledge of traditional Spider-Man to weave together a familiar yet entirely fresh story in a parallel universe. The film was packed full of hilarity, teachable moments and heart wrenching emotion; not a second of storytelling was wasted. Brooklyn teen Miles Morales (voiced by Shameik Moore, Dope), is bitten by a radioactive spider while spray painting graffiti with his uncle (Mahershala Ali, Moonlight) and becomes the Spider-Man of his universe. As the son of New York cop Jefferson Davis (Brian Tyree Henry, Widows), Miles struggles with differences between him and his father as well as standing out in a new school. His personal problems, however, quickly fade as Miles learns of Kingpin’s (Liev Schreiber, Spotlight) plot to use a supercollider under Brooklyn to connect multiple dimensions, despite a high risk of the dimensional manipulation causing a black hole. When Spider-People from alternate dimensions wind up in New York, including Peter B. Parker (Jake Johnson, The LEGO Movie), Gwen Stacy (Hailee Steinfeld, The Edge of Seventeen), Spider-Man Noir (Nicolas Cage, National Treasure), Spider-Ham (John Mulaney, Kid Gorgeous at Radio City) and Peni Parker (Kimiko Glenn, Nerve), Miles is tasked with sending them back to their universes while stopping Kingpin’s supercollider. The other Spider-People cast doubt upon Miles’ ability, given his inexperience with his newly acquired powers. Miles needs to learn to control his immense and surprisingly unique set of powers to have any chance at defeating Kingpin. The plot of the gorgeously animated movie felt entirely satisfying, with meaningful and in-depth portrayals of characters. The twists in the movie managed to be both shocking and founded, with tear-jerking revelations adding to the movie’s already emotional storyline. “Spider-Man: Into the Spider-Verse” is more emotionally dynamic than it has any right to be, as it masterfully weaves comedic elements such as Peter Porker and Miles’ awkwardness into a moving story of a father trying not to drift apart from his son, all without missing a beat. 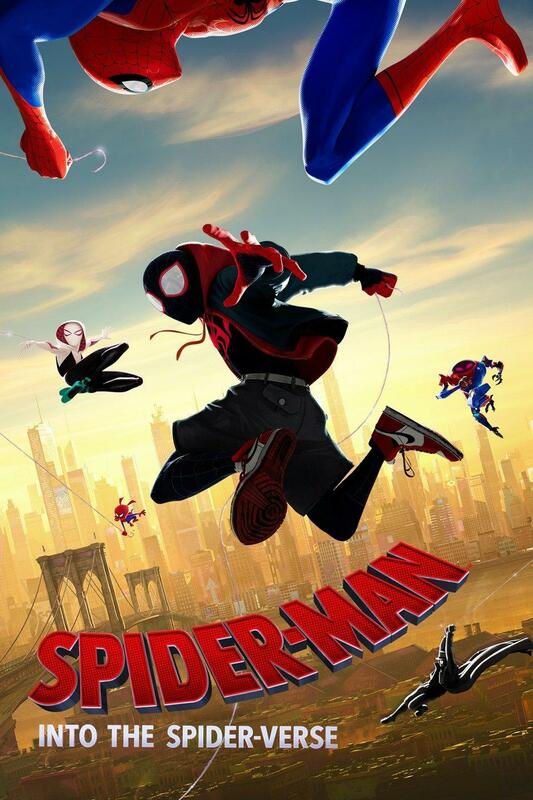 The soundtrack of the movie adds to the already incredible film by setting the mood of the film, with Post Malone and Swae Lee’s incredibly catchy “Sunflower (Spider-Man: Into the Spider-Verse)” leading the upbeat and smooth tone of the film perfectly. The entire soundtrack compliments the breathtaking visuals, making for what can only be described as art. “Spider-Man: Into the Spider-Verse” is an unforgettable origin story for a lovable half-black, half-latino Spider-Man, one that strays from the beaten path of not only superhero movies, but of all cinema. The film does not truly belong to any one genre, and that is what makes it so remarkable. Its appeal seems boundless, and watching the movie should be a top priority for anyone and everyone with a love for Spidey or just a beautiful story.